We arrived at the Estival Park Apartments opened the door of apt 7821 and thought god this is basic everything was well used the bath was rusty the cooker was old the sofa was dirty and the whole place needed painting. The long and short of it was we complained about a foul smell from the toilet which was unbearable and after being told we could not move apts because there were no other apts empty we said we were going to get a flight home however the air tours rep got us another apt in La Pineda Park apts and they were beautiful 5 star. This saved our holiday. La Pineda is a lovely place quiet and not too big. The Waterfront restaurant is the best place to eat. Julie and her staff are lovely. We will go back to La Pinead but not to the Estival Park. what an awful place. hotel staff very unfriendly in reception not bothered there only concern was that they already had your money.strange coincidence that on reading a previous report from a couple that had stayed there just before us,we were given the same apartment 7821 for four of us (2ad 2child), it was only big enough for two, let alone four, and as they quite righly said it was filthy. funny, as every other apartment (there must have been around 200) was empty.after complaining upon arrival having had to find it yourself they relucttantly moved us to a bit better one. there was no rep available and on telling her the next day at the welcome meeting she was not slightest bit interested.we saw four people that week so all apts were obviously empty.towards end of week most of the holidaymakers were spanish. would not stay here again even if it were free. Hotel could do with up datind being a 4 star hotel, as this did not reflect its star rating. Corridors on the second floor where we were alloocated were filthy, the carpet had seen better days. The bed room was clean on a dailt basis, however the linen were changed once in ten days after I complained to the reception, and asked for it to be done immediately. The food was cold or warm, depending how early you went to the dining room. Except for the reception staff who smiled occassionaly and some of the resturant staff who greet you and smiled sometime, the rest of the staff were sad and it appears we the guest were a problem to them and they were doing us a favour. There was basically no entertainment in the days for adults and the evening were worse. I would not recommend this hotel to anyone. Just returned from La Pineda which I can only describe as the worst holiday I have ever been on. Stayed in Estival park apartments half board and ate in 4 star hotel bad idea!!!!!! There is no maid service in apartments, you change your own bed wash your own towels and buy your own toilet rolls none of which is advertised in the brochure!!!!!!! The food in hotel is awful basically the same thing every night mini octupus, if that appeals to you!!! Could only eat there for the first week and a half as I found 3 dead flies in the bottle of vinegar couldn't eat there after that had the extra expense of eating in a local pub down the street. I would not recommend Salou as a holiday choice to anyone as I for one will definitely never return I found the local Spaniards to be very rude and the general area to be very unappealing!!!! The apartments were very clean and well equipped. The was a large balcony with retractable sun shade, tables and chairs. Each block of apartments had its own swimming pool and you were issued with a key to get access to your own block of apartments. 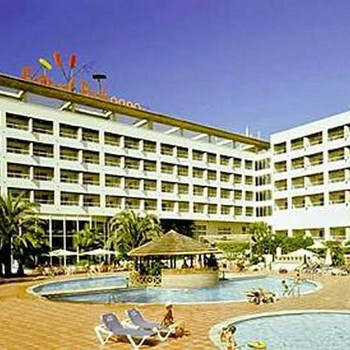 You could also use the swimming pools at the hotels which gave lots of choose. The pools were very clean and suitable for all ages with a divide between the shallow kiddies pool and the deep pool. The apartments pool was nice and quiet with only residents of the apartments able to use them. The was no air conditioning but large ceiling fans in the bedrooms. There was entertainment in the hotel each evening, a great playground for the kids and Clubs(Kiddies, Junior Club 8 to 16 year olds and one for adults). Well run with plenty of variety. The best thing was the location. Two minutes to the promenade and the beach, beside the Aquapolis water park, Bus stop 2 minutes, very cheap and easy to get into Salou or Portaventura Theme park. Our family of 4 consisting of 2 adults a 3 year old and 8 month old stayed Half Board. I hadn't read any reviews of anyone staying on HB basis so I thought I would leave one. We were allocated an apartment so got all the facilities the Self Caters got. Not the biggest apartment but very clean. The complex is split up in to small clusters of apartments which you need to use a keys to get into your allocated area of apartments and pool. This made you feel very secure knowing that only people staying in your area and the security guards have excess, also they are the only people that can use your pool so it was never over run. However, you could still use any one of the three hotel pools as well, so the variety was fab. The only problem is that the apartment pool did not have any parasols, so in the height of summer we would have invested in one. The maids were there every day. Loads of kitchen equipment which was brilliant with little ones. The balcony was enormous and had a retractable shade which again was great. The food was plentiful and a wide variety of salads, meats, fish and puddings, something for everyone. The only fault we had was that the restaurant didn't open until 7.30pm which by this time our kiddies were a bit cranky. Also the drinks we found to be quite expensive. We can't really comment on the entertainment as we didn't see any having young children. The location was great, the beach is a hop skip and jump away and very family friendly. Aquapolis swim and dolphinarium park is less than 5 mintues walk. Port Adventura is about 20 mintues down the road. A really fab base for touring the area. All in all we would definately return to Estival Park again, hopefully very soon !! Second visit to Estival Park Apartments. Lots of work going on and our apartment had a brand new kitchen with all new appliances. Glad to see all apartments had a lick of paint too since last year. Very impresssed again with location and cleanliness of area. We loved it, kids loved it but being teenagers now did get a bit bored when not at Portaventura or water park! May return but wait till kids have grown up and hubby and I can relax! My partner and I stayed at the Estival Park Apartments in August this year and had an excellent holiday. The security in the complex is excellent each area of apartments can only be entered and exited if you have a key to the gate and the key only fits the gate for the area that you are staying in. Only people staying in the neigbouring apartments can use the pool in your area. There are approx 10 different areas of apartment all with locked gates so no one can enter the area unless they have a key. The apartment we had was a large spacious one bed room apartment with a view over our pool towards the Estival hotels at the other end of the complex. The apartments were spotless and rooms were cleaned 3 times during the week we were there. We did not eat in either of the hotels so cannot comment on the food. There was nightly entertainment in the hotels but did not see any so cannot comment. The location is excellent particularly the apartment we were in it was a 1 minute walk to the local bars, shops & restaurants. Approx 2 minute walk to the beach. Facilites in the Estival complex are excellent indoor pool, tennis courts, gym, sauna to name but a few all of these facilities can be used by anyone staying in the apartments or hotel. The apartments could do with a lick of paint some of them have recently been painted but most do need painted. The paint is flaking off some of the buildings, perhaps in the winter they will get painted. Check in time for the apartments is 1500, we arrived at the apartments around 12, left our luggage in a locked room and were told to return to reception around 1430 to see if our apartment was ready. We chanced it and went back around 1345 and got our key. My family and I stayed at the EstivalPark Apartments in May this year. We were dropped off at EstivalOne but were then to find check in is in EstivalTwo which made for a hot and difficult start lugging our cases from one place to another. However from then on our holiday was fab! The apartment was close to the pool which serviced only 100 apartments so it was never crowded. Our apartment was spacious and clean,cool all the time because of the way it was positioned. I was particularly pleased that a key was needed to enter the apartment area so security was excellent! The only fault with the apartment was that it could have done with a lick of paint as the white paint was peeling off the walls outside making first impressions a little disappointing particularly when other areas used by holiday makers from other countries were beautifully decorated. Is it a case of "the Brits will not complain and just put up with it perhaps!" There was a two minute stroll to the sea and all amenities were also close at hand. The kids especially loved that the water park could be seen from the apartment! On the whole, a great place to stay. All the hotel facilities can be used by people staying in the apartments and the entertainement seemed varied though we didn't actually go to any.